3 stars. Like I said, this is a good story, and of all of Roth's books, it's probably her best. I think I liked it more than I liked her other books (definitely more than I liked Insurgent and Allegiant - though I never fully read Allegiant). I want to see where the story goes. But there were some things that held me back a little, in terms of my rating. I know how you feel! Allegiant was a letdown, right? This one was good - but not great, you know? Thank you, Amy! I have been hesitant about this book since I heard about it, and after reading your review I probably won't read it. There are just too many books out there:-) Thanks for your review! After reading Roth's debut trilogy, I was hesitant about this one too. To be honest, I only read it because I was sent an ARC. It was good, but there were issues along the way. You're welcome and thank YOU, Tammy! I was excited about this book as soon as I heard about it, but I've been very hesitant to read it ever since Book Twitter classified it as racist. I can -definitely- see the problem and I'm not sure what V Roth was thinking when she made the violent villains brown-skinned... I'm glad you were still able to enjoy though, even while noting the problematic content. I may still read this one at some point, but it's definitely not as high on my list as it was. Great review! It is indeed problematic, in terms of the racial aspects. Perhaps it was unintentional, but the author definitely fell into the dark-skinned-aggressor trap, which isn't good. There were other issues with the book, but that one is at the forefront. damn it, I was all excited and wanting to read it. Science fiction plus fantasy yes please? Hmm interesting review. I can see how the beginning can be boring as well as overwhelming to read with so much information presented at once. I am not sure I am going to rush to grab this one. If you do end up reading it though, borrow it from the library! Hopefully you'll like it, but keep an eye out for those issues. Thanks for highlighting the good and no so good parts of the book. I'm always a little scared reading a book that's super hyped, so I think I'll hold off for now. And hmm, the problematic racial components are leaving me a bit bleh. The hype monster is so real! With this one, I think the book was good (like the story was interesting), but the issues were definitely there too. I feel totally crazy for saying this, but I don't actually have any interest in reading this book. After seeing Justina Ireland talk about it on twitter (she's so damn smart, love her feed) I was pretty much sure that I'd avoid it...and since then a lot more people have struggled with the representation of race here, just like you Alyssa. WHY do authors do these things?! If you end up reading the book, I hope you enjoy it! Perhaps borrow it from the library before buying it, if anything. I've been torn on this one... I did preorder it because I want that Divergent epilogue (I'm one of the very few people who actually liked Allegiant lol) But IDK if I'm going to rush to get to this one. Great review! Hmm, interesting review. I know that I still want to give it a try. I remember when I read an advanced readers copy of Divergent before it came out, and I actually thought it was pretty violent. So now I'm guessing this one is pretty bad. Thanks for all the heads up on things. This one is soooooo much more violent than Divergent. It is almost excessive, at times. If you read this one, I hope you like it! I have some reservations about reading this book, primarily because I wasn't happy with how she ended the Divergent series. But with your review now I think I'll save my money and wait to borrow it from the library. Great review Alyssa! SAME! I hated the ending of Allegiant (I actually didn't even read the book). Borrowing from the library is a very good idea. Nice! I was actually really excited for this book. More so because Roth was writing again! I feel like when authors make it big with Hollywood they quit writing for reasons. You never really know why, but you just notice that there are no books on the shelves but for those that were made into movies. So yeah, I am excited for this one! I had no issues with Allegiant really and what happened there. I do see why so many people were angry though. It worries me a bit though that you're saying there's two points of view. I would hope Roth didn't repeat herself. It doesn't seem like something she would do. I can only imagine the hate mail she received when Allegiant happened. But I will admit I admire her strength to write a book with an ending that might not be well received. She saw in her mind that it was the right move for her character. I guess that's why in part, I never had issues with it. Definitely looking forward to this one! Didn't know it was a duology at first and was almost resigning myself to waiting until next year to start it, but no killer cliffhanger you say? That may change things for me! Not sure though because I do enjoy binging those duologies! LOL! Great review! That does seem to be a trend! Like Suzanne Collins, and J.K. Rowling (kind of). I didn't really talk about Allegiant here? Allegiant is its own thing. 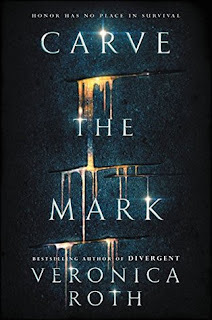 Carve the Mark has so many problems and the problems have nothing to do with Allegiant. It is a duology! I could see myself reading the second book, to see how it all ends. You're welcome, and thank YOU, Liza! I'm so torn about if I want to read this book or not. I really wanted to read this one at first, but I can fully understand the issues people have with it. I don't even know. I also really hated the last Divergent book so I may avoid any more of her books because of that alone haha. :P Great review though! Lovely review sweet girl. <3 I'm so glad you enjoyed this book :) I'm pretty excited about reading it, tbh. I think I will love the characters and the romance too :D Yay! Thank you, Carina! I hope you enjoy the book (are you still reading it? Probably not? I'm late on replying to these comments. Ahhh!). I have a question. It might sound silly or whatever but when I have the chance I try to find the specific editions of the specific books I fall love with. I know Veronica Roth has made 2 versions of this book's cover, this is the current cover although she softly announced that it would come hardcover and I would've bought it in my mother tonge if it had come hardcover into the Spanish translated version. I like this one as it comes with the stellar map softly carved in the dark-blue hardcover a part from the current protective cover. I've find a hardcover in original version on amazon and I just wanted to know if Veronica has released hardcover versions in other countries or whatever. I agree about the violence aspect, like; i don't mind some realistic violence but this is a little over the top. 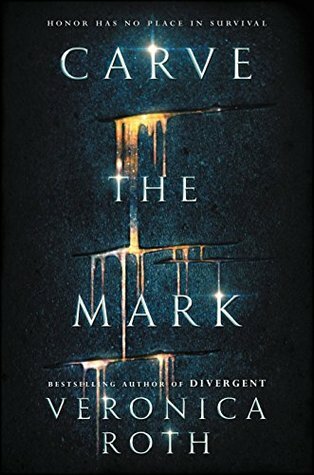 The way I see it, Carve the Mark is basically Divergent mixed with Star Wars with more violence than both, and less romance than Divergent. I sure hope the second one doesn't turn out like Allegi-- i mean... the book we shall not speak of. Yes! I'm glad you agree! It seems too brutal and almost necessary, at times. I definitely see what you're saying about Divergent + Star Wars. Oh man, if this book sequel's is A*******t part II, I am going to SCREAM! It would be so horrible! I'm glad you liked this one overall! The brutality was both fantastic (in that it was written incredibly well) and horrifying (it was too much sometimes). I think I'll be reading the next book because I can't not know how things end, you know? But I agree, standalones are so much more preferable these days. Patience is hard to come by!